Sometimes investors and even company executives may mistake gross margin for contribution margin. That is an incorrect assumption. The gross profit margin for a company is not the same as the company's contribution margin. While gross profit margin establishes the overall profitability of a company, the contribution margin shows the gross profit contribution of a given product or group of products offered by the company. Gross margin is a group photo; contribution margins are individual snapshots. Contribution margin is calculated by first establishing the revenue derived from the sales of a particular item, next subtracting from that figure all direct production costs associated with that same item, then dividing the result by the revenue figure. The contribution margin tells you is how profitable one item in a product line is in comparison with another. The contribution margin is an individual snapshot, taken close up. The benefits of contribution margin calculations are relatively straightforward: if an item's contribution margin, established as a percentage of profitability, ranks lowest in a company's product line, the firm can then address this particular product's issues, either by raising its price or by reducing in whatever ways possible the item's variable production costs or, if necessary, replacing that product with another product with a greater potential for profit. Many years ago, The New Yorker ran a striking cartoon showing an executive on an airplane production line talking with his foreman, bewildered that he can't find the bottleneck that's delaying production and increasing his airplanes' costs. Above him, in a loft that we see (but that they do not), is an approximation of the figure in "Whistler's Mother." Behind her is a huge pile of aircraft seat cushions. In the foreground, we see her in the process of carefully hand-embroidering a single cushion. The airplane company's gross margin reflects the overall loss of profitability. The contribution margin tells us more about where and how the problem originates. Both financial ratios give us useful information about a company. 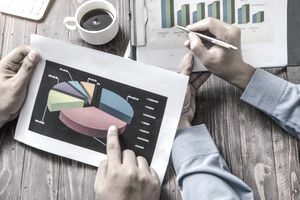 Gross Margin assesses a company's general ability to bring profitable products to market -- essential information when evaluating a company for investment, for example. Contribution Margin zooms in and allows a company to critically assess the profitability of individual products, especially in relation to others in the company's product line. Neither of these ratios, however, is designed primarily to assess a company's overall financial viability. Excluded from both ratios are a company's fixed costs -- among them costs associated with salaried employees and executives and other costs associated with its physical plant. Two companies could have similar gross margin and contribution margin ratios, but if one company's executives draw high salaries and benefits and that company physical plant costs are also high, it will be far less likely to succeed than the other company that manages to keep its fixed costs low.